The Cheetah is a large cat and is known for being the fastest of all the land animals. It can reach speeds of up to 70 miles per hour. The Cheetah can accelerate from 0 to 60 in around 3 1/2 seconds. This is faster than most sports cars! 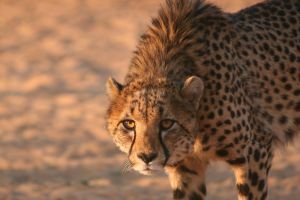 Cheetahs are mostly found in Africa, but there is a small population of Cheetahs in the country of Iran. Cheetahs are found in a wide variety of habitats and like to live in open areas of land like the African grasslands and savanna. Female cheetahs will establish a large home range that may overlap with other female cheetahs. Males, on the other hand, will typically establish a much smaller territory. Do they live in groups? Male cheetahs will often group together in groups called coalitions. They usually group with brothers, but may also group with an existing group or other males that were the lone male in their litter. Female cheetahs, however, hunt alone with the exception of their own cubs. Cheetahs have a short tan coat that has small black spots which helps them to hide or be camouflaged. There are no spots on the cheetah's white stomach area. Adult cheetahs will grow to between 90 and 140 pounds and around 4 to 4.5 feet long. They have a slim body, long legs, a deep chest, and a narrow waist. The female cheetah is usually smaller than the male, but there are no major differences in appearance between the male and female cheetah. Cheetahs are smaller than the typical big cats like the lion, tiger, leopard, and jaguar. They also can't roar like all the larger cats. However, cheetahs are often considered the smallest of the big cats. Cheetahs mostly eat small to mid-size mammals such as gazelles, impala, guinea fowl, and hares. Cheetahs hunt at dusk or dawn. They hunt by sight. Once they spot prey they will sneak up as close as they can and then use their superior speed to catch the prey. Cheetahs will usually eat their meal as fast as possible before a lion or a pack of hyenas can take it away. Baby cheetahs are called cubs. They are very vulnerable when they are born especially to their natural enemies; lions, leopards, and packs of hyenas. A typical cheetah will live for 12 years. Yes, cheetahs are considered an endangered species. It is estimated there were over 100,000 cheetahs in 1900, but there are only around 11,000 today. 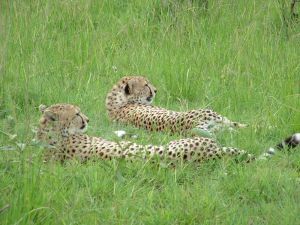 Cheetahs will use their tails to help turn when they are running at full speed. Although they can't roar, they can make a number of other sounds such as purring, chirping, yowling, and growling. They use some of these sounds to communicate with other cheetahs. The Ancient Egyptians kept cheetahs as pets. The mascot for Cheetos is Chester Cheetah.